Yes, now they have their very own 59-shooter. Meet Canadian Drew Nesbitt. Just as Oliver Fisher did on Friday, Drew went out Saturday with the intention of making the cut. (The second round had been weather-delayed.) However, unlike Oliver, Drew had shot a 79 on Thursday and was all but out the door for the weekend. It's amazing how a little thing like a 59 can turn things around. The two rounds averaged out under par, putting him at -4 and saving his weekend. But it was the way he did it that caught my attention. Drew had one bogey. That's not really unusual, of course; many players overcome a bogey in their record-setting round. But you see, Drew only had five birdies. 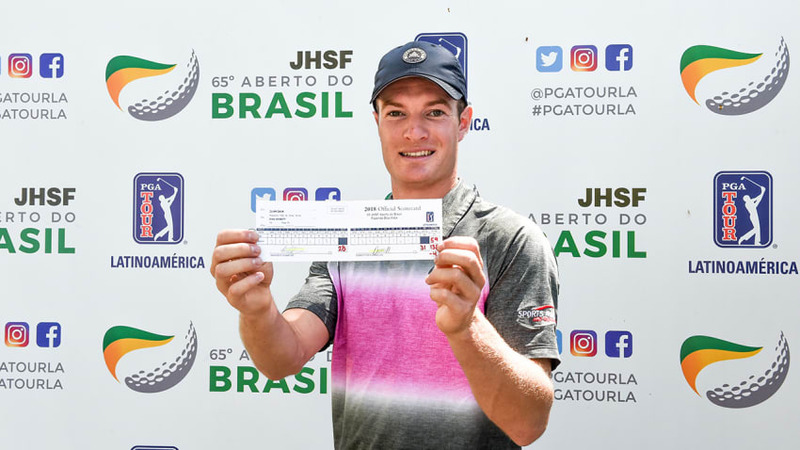 The rest of his score came from FOUR EAGLES -- specifically, a hole-in-one on the par-3 2nd, a hole-out from the fairway on the par-4 10th, and (more traditional) eagles on the par-5 11th and 18th. He ended up playing 29 holes on Saturday, so perhaps it's not surprising that his third round was a two-over 73. It's unlikely that he'll win this weekend, but he will get a paycheck. That should help ease the disappointment of his loss. Oh yeah, and then there's that spot in the record books. Now how do you say "Mr. 59" in Spanish again? The language of Brazil is Portuguese, not Spanish, which means you should call Drew "Senhor cinquenta e nove"
I have a friend who lives in Brazil, IC, so I knew that. But I was thinking about the tour as a whole, not just Brazil.